By August, most of the ponds along my walk become choked with algae and duckweed, whose growth is accelerated by fertilizer runoff from lawns and fields. These floating plants rob the water of oxygen needed by fish, crayfish, and other aquatic fauna. 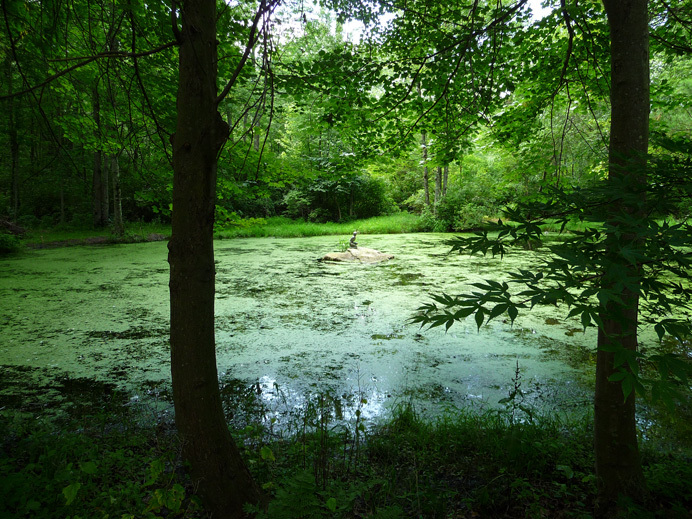 Thus, a pond that looks wonderfully green, like this one, may be essentially sick. Or at least that's what you hear from environmentalists. When I pass this pond at night, I still hear the basso profundo of bullfrogs. If I step too close in daytime, dozens of smaller frogs and salamanders plop into the water to escape me. And the blue heron I photographed here on July 30 must be finding minnows, or he wouldn't bother visiting. Maybe the environmentalsts are exaggerating. .